As I mentioned, back in August I was asked to review two books. I said yes, and they arrived, the first being A Street Cat Named Bob by James Bowen. 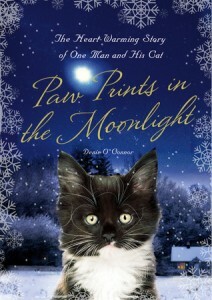 The second was called "Paw Tracks in the Moonlight by Denis O'Connor". I wanted to read it, and I kept trying and trying to read it, but I had the worst time getting into it. The best reason I can describe it might be when you are introduced to someone you are told you will really like but you find you come from two entirely different worlds and you just can't find that common ground to get started on. The book starts with the death of a mother cat and one of her kittens. That was so hard for me to get past. I just knew the story would get better, but with hard luck foster kittens in my basement, I just couldn't keep reading to get to that point. I can't tell you how many times I picked it up only to put it down. I felt bad about it and kept trying. Finally earlier this month I told myself to just keep reading.. and I'm so glad I did. While I do not agree with Denis on many aspects of raising Toby Jug, I can not fault him as he raised a wonderful kitty who had a long happy life. It was an excellent reminder to me that while I feel I am caring for my cats in the best possible way I can, it does not mean that people who choose differently are wrong. It is something I need to be reminded of from time to time in my quest to remain nonjudgmental of and open to others. Toby Jug was a very remarkable cat, and I really did enjoy getting to know him. I am so glad Denis decided to write his story to share him with the world. The story is the first year of Toby Jug's life and it was so much fun to "watch" him grow up. The final chapter is the end of Toby Jug's life. I knew it was coming, and I prepared for it by making sure I had tissues and I didn't need to be in public for the next hour or so.. and yes, I cried and cried.. It didn't help that Toby Jug had a similar physical description to my Ollie nor passed rather similarly to my Em. My heart just ached for Denis... and for myself. This book is once again from "across the pond" so the English references are peppered through out. Being so, they retooled it for the US market including a new title and new book cover. 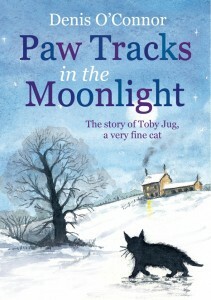 PAW PRINTS IN THE MOONLIGHT by Denis O’Connor is the survival story of Toby Jug, a rescued kitten who forms an extraordinary bond with his new owner. O’Connor’s tale chronicles the pair’s quirky adventures, from Toby Jug’s mischievous antics to the life-changing summer camping trip that cements their friendship. "Touching... Both a wonderful cat story and a portrait of rural England that will satisfy everyone who is or was a fan of All Creatures Great and Small. His charming book belongs on every cat lover's reading list." I was sent a free copy of the book, but it in no way influenced my review nor this post. I did pass the book on to someone I hope will read it and appreciate it. I took on four pretty uniquely named cats, so I don't really feel comfortable sharing their names. There were special needs, and I was uniquely suited to care for them. It took a while for them to relax with me, but one of the four never did. She would hide when ever I came in the room. I was able to pull her out and hug and kiss her, but she would never fail to tell me she much preferred to be hidden. Well just over a week with me and she came out on her own, ate well, looked at me, let me pat her. I was so proud of her for being so brave and trusting me. They were all very awesome cats and I was really enjoying their company. Yesterday afternoon I got a call that the person was ready to take the cats back. So off they went. I was sad that they were leaving so soon, but happy that they were able to reunite with their owner - who loves them very very much - and that they would be going to a safer place. This was a very emotional foster situation for me for a couple of reasons - I don't feel the need to go into all of the details - so after dropping them off I said I wanted to ask about kittens but wasn't sure I should. Chances are they wouldn't have had any for me, but before I could really even finish speculating about if they had any, the shelter staff I was talking to told me there were. Me being me, I couldn't help but go take a look. Three little boys, two black, one gray with white.. all purring up a storm and seeking attention. I so needed that. They have slightly goopy eyes, so we'll be waiting till those clear up. They are of weight, but yet underweight. aka they are over 2.5 lbs but they feel like fur and bones. So a few days of love and food and paws crossed they'll go back in 2013 with no complications. Now that Christmas has passed, I thought it only fair to the people who sent it to me to open it up and share it with my kitties and with all of you. It came from Charlemagne, Tamar and Mal and The Crew wants to send a great big THANK YOU!! for individually wrapped presents..
so I snagged it back, unwrapped it and gave it to him..
What? I am being good!! really!! the individual wrapped gifties minutes the ones off being played with. Thank you again Mal. It was so much fun and very much appreciated. Well it was a nice Christmas by all accounts. I went and spent Christmas eve at my sister's place with my family. I am blessed that my immediate family is all in the area and all in good health. My nephews are a absolute riot, and I enjoy spending time with them. And there were frosted molasses cookies, which have been a staple of family Christmas. My husband also innocently said that it is sad we don't have a "family picture" of the cats, you know, all lined up and posed. I couldn't help but giggle. I told him that would only happen with photoshop. I am so hoping one of these days to get off my procrastinating duff and learn that (anyone know of any good tutorials? and when I mean tutorials, I mean starting from "this is photoshop") but we did have a little bit of fun dressing up The Crew in their holiday finest (that we found in the dollar bin at Target along with a few left over from years past) I know a lot of people don't think dressing up cats is good clean fun, but I only do it to those cats who are accepting of it, and they get well compensated with treats..
Twee thought all these shenanigans were a bit over the top. She's not a big fan of change nor the competition for treats, so she just sat under the table till things slowed down. Fleurp just wondered when we were going to get to the good stuff - when the wrapping paper, tissue and boxes would be strewn about the room..
And then we got to the stockings..
Yup, they got Da Bird.. everyone was instantly attracted to it, and sadly I shouldn't have started playing with it on the hard wood floors. it is hard to get traction enough to jump, but I soon moved over to the area rug and there was a lot of fun. Sadly after just a few short minutes my most skilled hunter damaged one of the feathers... who is my most skilled hunter?? bet you'd never guess..
Yup, my few kibbles short of a bowlful kitty is the most skilled at pulling things out of the air.. even after all this time it still amazes me..
Then it was movie time..